The Babine cuts through a wild and remote section of the Coast Mountain Range. Larger than many nations, the north by northwest region of British Columbia runs up the Pacific coast to the Yukon border—a vast landscape surrounded by snow-peaked mountains and thousands of lakes. It is also home to the Gitxsan people whose villages and towering cedar totems cab be seen while traveling the Babine. The Gitxsan, known as “People of the River of Mist” have called the region home for thousands of years and have created diverse and colourful lifestyles, traditions and artistry. We will visit abandoned and occupied villages of the Gitksan housing some of the largest, most visually splendid totems ever created. 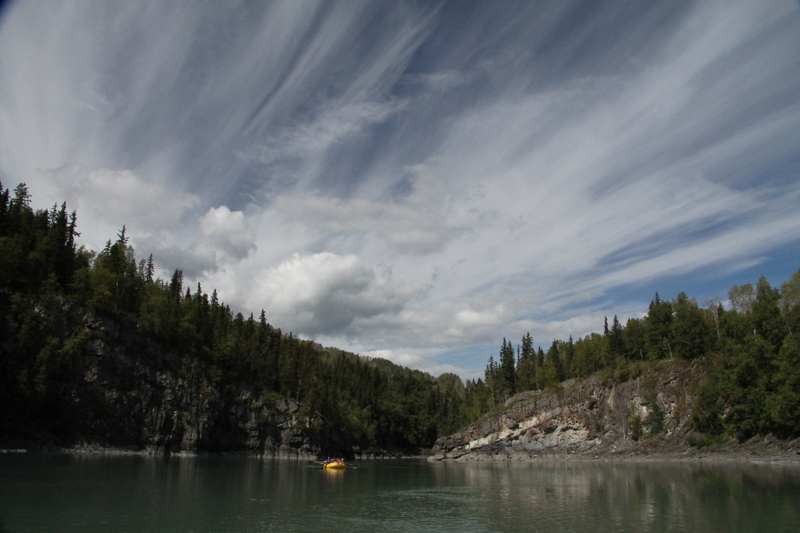 The Babine is also known as “River of Grizzlies”. It is the site of a steelhead and Pacific salmon spawn every year between July and late September. A migratory population of grizzlies are often see fishing from shore as we cruise past in our raft … at a comfy distance. Hundreds of bald eagles, also attracted by the great fishing, can be easily spotted. Other birds of prey include the golden eagle, rough-legged hawk, red-tailed hawk and peregrine falcon. Towering cedars and hemlock rim the shore; beyond is a forest floor rich in mosses and ferns, home to other mammals including wolf, wolverine, lynx, marten, mink and moose. 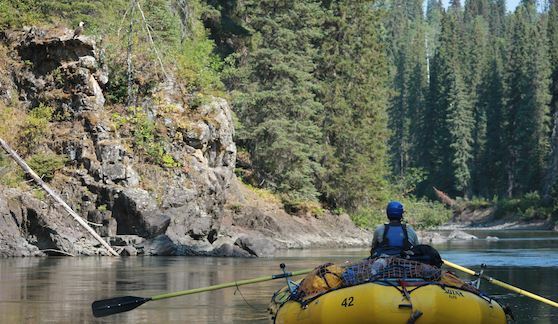 An easy and constant ccurrent carries us for four days along the Babine, interspersed with exciting rapids. A complete itinerary along with maps, clothing and equipment list, will be issued upon registration. 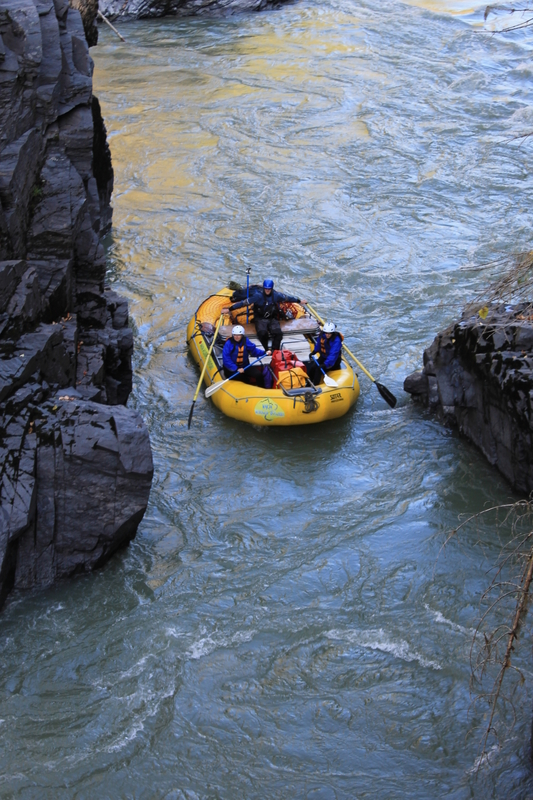 Included: Rafts, paddles, PFDs [life jacket], waterproof bags, transportation from Smithers and return,camping fees, cooking gear, camp stoves, tents, meal preparations, meals/snacks/beverages on the expedition, tarps, major first aid supplies, emergency radio or satellite phone, and professional guides. Excluded: Transportation to point of origin, transfers, accommodation and food other than included in the itinerary, gratuities, and personal equipment. Meals: All meals while on the river. I T I N E R A R Y ARRIVAL DAY Your trip begins the evening before we start rafting. Upon arrival at the Smithers airport your hotel can arrange a shuttle to bring you to the hotel. Later in the evening we will have a pre-trip meeting where you will meet the guides and all the other travelers. Waiv-ers will be signed and any lingering paperwork will be completed. You will receive your special dry bags for packing your personal belongings into. We will also have a briefing on gear, clothing, and the river itself. DAY ONE – 8 MILES OF RAFTING This morning we meet after breakfast in the hotel lobby to prepare for our departure. There‟s time to do any last minute shopping, grab a latté and board the van for our transfer to Rainbow Alley and the headwaters of the Babine River. 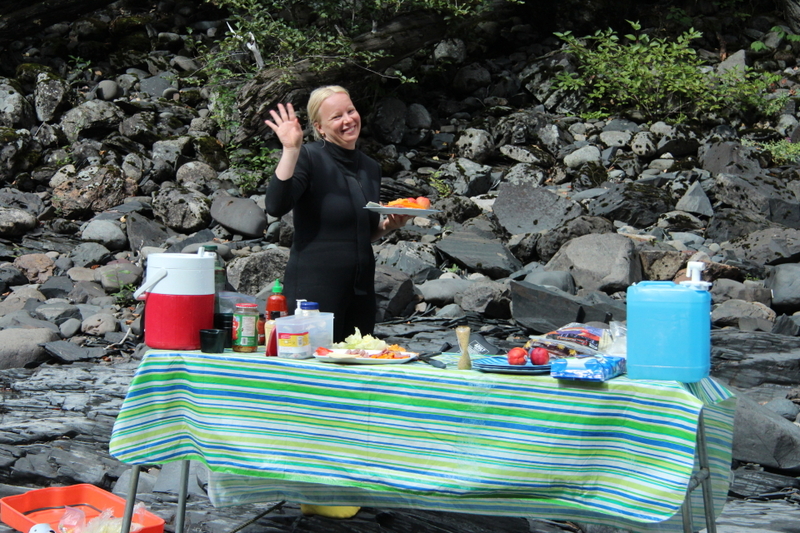 Here we meet the rest of the guides, enjoy a deli-style lunch at the river‟s edge. Before we launch there will be a river orientation and safety talk, and by early afternoon, we‟ll be on the river. A couple of hours later, we‟ll arrive at our first camp where we‟ll enjoy cocktails and hors d‟oeuvres as we set camp and settle in. The first of many sumptuous dinners follows before we collect around the campfire under a star-filled sky. DAY TWO, THREE, FOUR & FIVE – 62 MILES OF RAFTING We typically begin each day with coffee and tea, followed by a hot breakfast that may fea-ture fluffy blueberry pancakes, breakfast burritos or perhaps West Coast eggs benny. Fresh fruit salad, granola, and yoghurt are always available. In short, you will not go hun-gry! 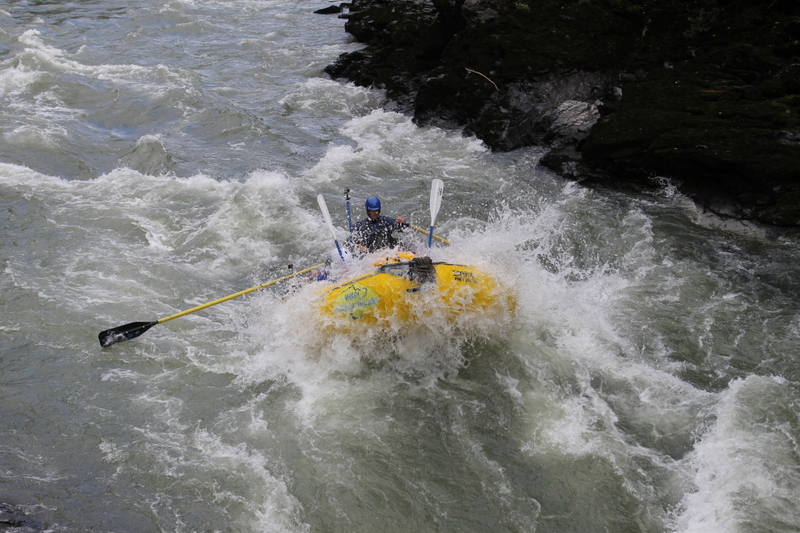 Once camp has been broken and the boats are packed we‟ll head downstream, usu-ally between 9:30 and 10am. 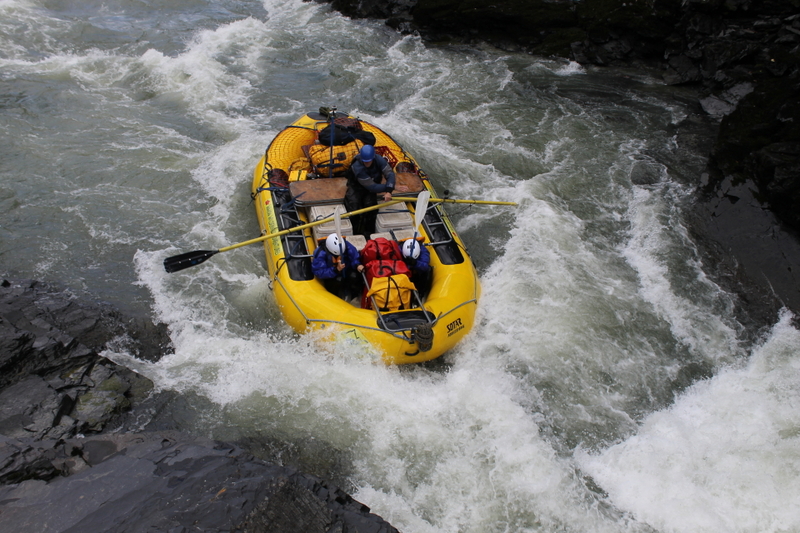 Our journey continues on Day Two through deep canyons passing several Class III rapids. The backdrop is thick Northern forest, with the mountains and glaciers of the Sicintine Range to the north. By Day Three the pace of the river picks up and we‟ll travel a sustained stretch of class III rapids highlighted by the exciting „Pinball Alley‟. 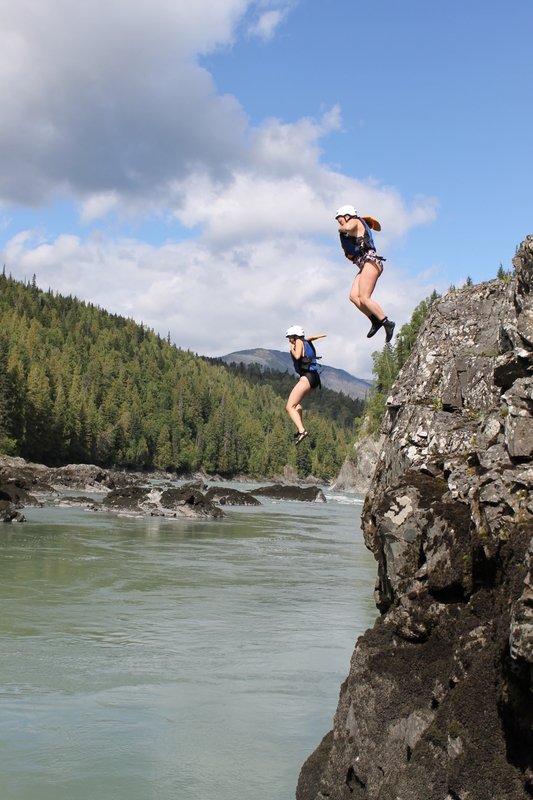 Tonight‟s camp is deep in the Babine Canyon with the adjacent waterfall providing a refreshing shower for the hardy. Day Four begins with a visit to the famous Class IV „Grizzly Drop‟ where it is quite common to see Grizzly Bears fishing! Later in the day there is an opportunity to hike to the aban-doned Native village of Kisgegas and the remnants of the turn-of-the-century Jesuit Mis-sion, now overgrown with wildflowers. After leaving Kisgegas, the river valley opens provid-ing vistas of Mount Thomlinson and the Babine pours its contents into the much larger Skeena River. Day Five begins with large splashy rapids—the sinuous waters and rock-lined canyons bordered by coastal cedars provide a mysterious ambience. 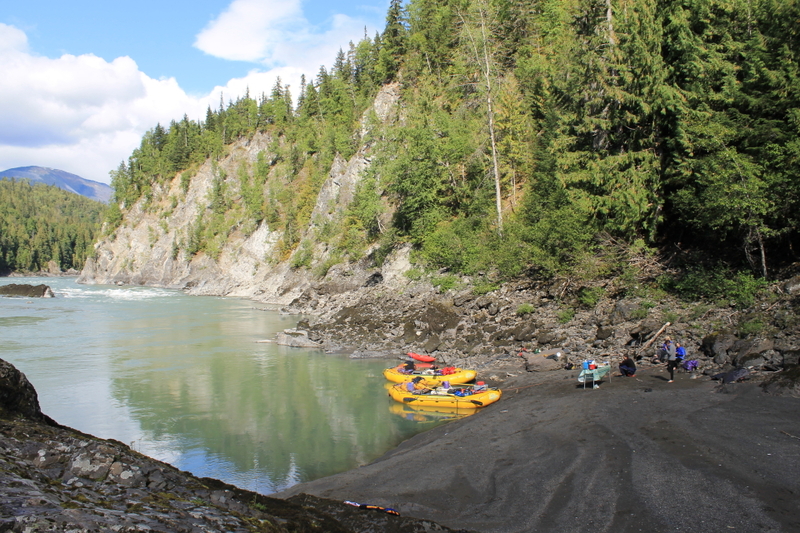 Our final campsite on the Skeena River provides a perfect setting for our final night in the wilderness together. DAY SIX – 10 MILES OF RAFTING & BACK TO CIVILIZATION On our final day of rafting we begin to see the signs of civilization along the shores. We pass the confluence of the Kispiox and Skeena rivers, next to the functioning native village of Kispiox, where giant totem poles pay silent tribute to generations past. We take out at Hazelton BC, the historic terminus of the steam powered river boats travelling the Lower Skeena at the turn of the century. Our evening is spent back in the relative luxury of Smith-ers where, after well-deserved hot showers, we‟ll get together for a final dinner. Stories can be practiced and embellished with your new friends before taking them home to family and friends. DEPARTURE DAY – HOMEWARD BOUND Flights from Smithers to Vancouver leave Smithers at approximately 10:00am and 6:00pm—there is a hotel shuttle to the airport to get you to whichever flight you‟ve booked. If you‟re on the earlier flight, you‟ll be back in Vancouver before noon, so connections home can be made that afternoon.